When you drive around the mountains surrounding Annecy you’ll pass many cyclists tempted by the challenging climbs which are sometimes pretty ambitious. 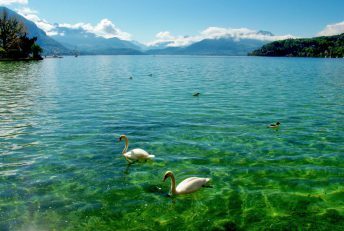 If you’re not one of them and prefer an easier bike tour then try cycling Lake Annecy. This scenic ride follows the outline of the lake. 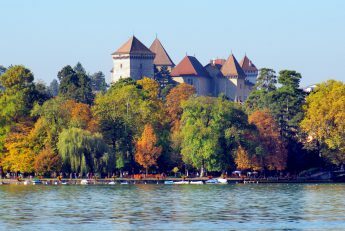 It offers fantastic views stretching from one side to the other of the crystal-clear lake, quaint little villages, formidable castles and snow-capped peaks. The car-free two way cycle path (“Voie Verte“) links Annecy to Ugine and follows a disused railway line. At times you’ll enter old railway tunnels. At the end of the lake (Doussard), you have the option to cycle back to Annecy on the other side of the lake (via Talloires, Menthon) or go back the way you came. However at the moment parts of the route between Bout-du-Lac and Menthon will take you on the main road (completion of the entire cycle path around the lake is planned by end 2020). So if you go this way be careful of traffic, particularly when Summer is in full swing. This section is not as flat as the other side. Between Talloires and Menthon there is a short steep climb of three bends but with with a durable touring bike you’ll be fine. If you are not in the mood for any hills then I recommended you start the opposite end from the East shore (Veyrier, Menthon, Talloires) and do the itinerary backwards which is not quite as steep. This circuit is great for cyclists that prefer flatter roads. It is approximately 43km long with an elevation of 464m. The route goes through Annecy and 7 picturesque villages. Good to know: in the Summer and on sunny Sundays the path can be crowded with families and tourists, particularly near the centre of Annecy where the cycle path is shared with roller skaters and pedestrians. Around the lake there are lots of amazing places to stop off and admire the view or even have a coffee half way round! We like the Boot Camp café in Talloires which is a bit of a bike hub and they organise charity rides too. The owners are English expats and will give you a warm welcome! If it’s Summer take your swimming things for a dip in the lake at the end of your ride and relax in the sun with warm croissants and coffee. The bike itinerary starts and ends in Annecy. 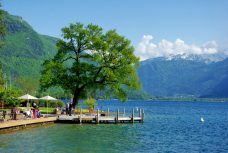 Along the way you’ll discover 7 beautiful villages and castles that make Lake Annecy one of the most popular tourist sites in the French Alps. 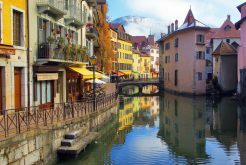 Situated 40km from Geneva, Annecy is nicknamed Venice of the Alps for its canals that run through the old town. The mighty fortress of the castle dominates the site with fine views over the lake and the surrounding mountains. The lakefront is also a popular spot with a marina, beach, the historic Imperial hotel and the romantic “Pont des Amours“. After a pleasant ride along the waterfront is the village of Sévrier. You’ll ride pass the beach and the marina. Saint-Jorioz also has a marina and it offers a spectacular view of the highest peaks around Lake Annecy, including La Tournette (2,351m). 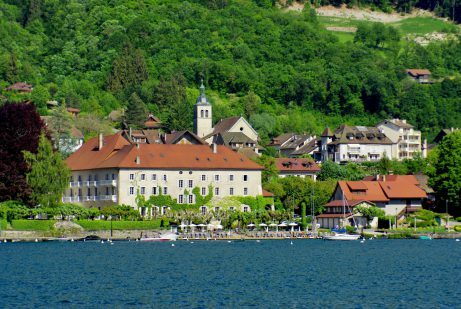 In the quaint village of Duingt admire the Ruphy castle which gives one of the most romantic views of Lake Annecy. From the cycle path you’ll get a good view over the crystal clear waters of the Little Lake almost completely surrounded by mountains. Situated in the commune of Doussard, the hamlet of Bout-du-Lac marks the end of the lake. There is the national natural reserve of the Bout-du-Lac d’Annecy. 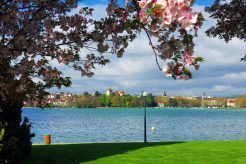 From Bout-du-Lac to Talloires, the cycle path follows the edge of the lake with splendid views. 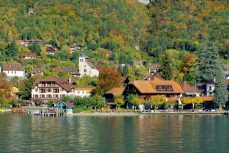 Talloires is a charming little village set on the Bay of Talloires. Since the beginning of the 20th century it has become a well known resort with famous hotels, restaurants and is a popular place for a stroll or a swim. The village is dominated by its fantastic medieval castle, still inhabited today. 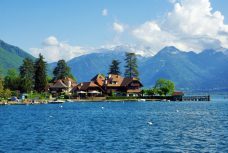 The last stage of cycling Lake Annecy is the village of Veyrier, which stretches out across the foot of Mount Veyrier and Mount Baron. With its villas and magnificent houses, Veyrier is an exclusive residential suburb of Annecy. 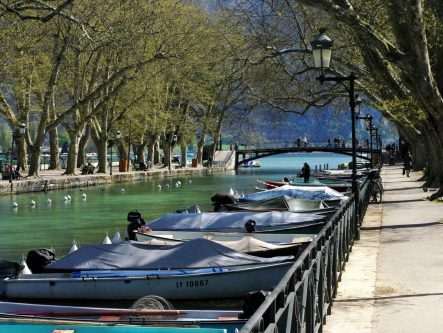 You’ll arrive back at Annecy via the marina, the Imperial Hotel and the beach front. If you find this circuit isn’t challenging enough then here are a few more ideas to give you more of a work-out! The mountain pass is a must for all cyclists. Many prefer climbing on the D42 road from Vesonne and Montmin (11.5kms from the valley). From the pass (altitude: 1,150m) there is one of the finest views you can get over Lake Annecy. The Col de la Forclaz is known for being a paragliding take-off spot. To reach the summit of the Semnoz you’ll have a steep climb up 18.5km of road. On the top (Crêt de Chatillon, 1,699m) is a small ski station. The view of the Alps of the Savoie and Mont Blanc is breathtaking. From La Clusaz the D909 road leads to the mountain pass of Col des Aravis (1,498m) with a few hairpin bends. The mountain pass has been used in the Tour de France at least 39 times! The Aravis Pass is a great place to spot the Mont Blanc in the distance. 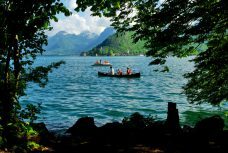 For more info about cycling and staying in Annecy visit the site of the Tourist Board of Lake Annecy. Disclaimer: This blog post includes a sponsored link. All content and opinions are our own.